2017. 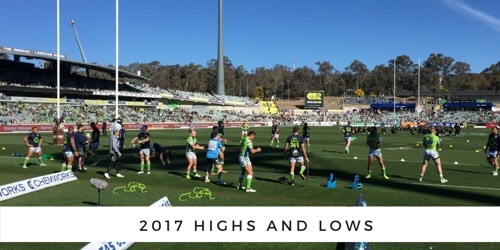 Many were predicting that this was the year that the long awaited premiership would arrive for the Canberra Raiders - after a second placed finish in 2016. Instead, they finished 10th, four competition points outside the top eight, missing the finals. The core of the squad was essentially the same as last year. The injury toll was low. How could it all go wrong? The Players of the Year and Best Backs, as determined by Fans' Choice Award voting, are Jordan Rapana and Nick Cotric. The voting ended in a tie, each receiving 24 points, with the two wingers having stand out seasons for the Green Machine. 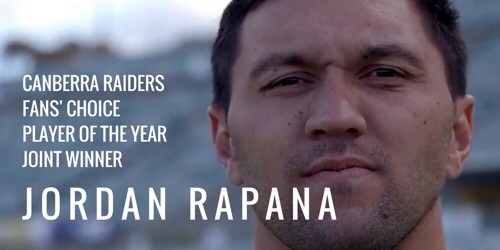 As the Players of the Year, Rapana and Cotric also took out the Fans' Choice Award for Backs of the Year. Jordan Rapana scored 21 tries in 2017, third highest in the NRL and was top try scorer for the club. 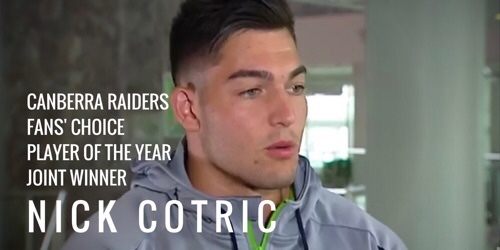 He and Noa Nadruku are now in the record book as the only Raiders players to score more than 20 tries in a season twice. He was also selected for New Zealand in this year's ANZAC Test in Canberra. Rapana was equal first in the NRL for line breaks (27) and second in the NRL for tackle breaks - at an average of over six per match. He produced a huge amount of work early in sets - and he finished second in the NRL for dummy half runs, making 9.5 metres per run. He averaged 138 metres gained per match, second at the Raiders to Jack Wighton. Nick Cotric, still just 18 years of age, scored 16 tries, finishing equal sixth on the NRL's top scoring list and second for the club. He was third in the NRL for tackle breaks (six per match) and sixth for line breaks (21). He averaged almost 10 metres per run and over 100 metres per match. Remarkably for a rookie, he played in every Raiders match and made just 14 errors for the season. His trademark was searching the opposition defensive line for a weakness... and exploting it. He also made some remarkable try saves this season, with intercepts and tackles on the goal line. Junior Paulo and Josh Papalii were joint winners of the Fans' Choice Award for Forwards of the Year. They also finished the season on equal points, with Josh Papalii grabbing a share of the title in the final week of voting. There is no doubt that the pair were the most damaging forwards for Canberra in attack this year. Paulo (129 metres from 14 runs per match) and Papalii (128 metres from 14 runs per match) were the Raiders' biggest metre eaters in the Raiders' forward pack. Papalii was in the top 10 forwards in the NRL for tackle breaks, while Paulo was in the top 10 forwards for offloads. Papalii topped the Raiders' forwards for line breaks (eight) and tackle breaks per match (three). Paulo (33) and Papalii (28) also produced the most offloads amongst the Canberra forwards. Papalii was Canberra's only representative in this year's Origin series - and would have represented Australia in the ANZAC Test this year, but for an off field issue. Nick Cotric and Royce Hunt were the only players to make their debut in 2017... but with Hunt appearing for a just a few minutes in one match... there is no real choice! A share of the Fans' Choice Award would have guaranteed him the club title... but it looks very much like he will win the Dally M Rookie of the Year as well. An amazing season. Round 22: Raiders 30 Sharks 12 at Cronulla. The forwards stood tall. Shannon Boyd and Junior Paulo did the tough stuff. Elliott Whitehead was a revelation after being shifted to lock. There were some breath taking tries - and there was a remarkable period where a 12 man Raiders outfit ground the Sharks out of the match. It left the fans wondering: where has this team been all year? Round 14: A 24-20 last gasp loss. It was, sadly, one of the worst in Raiders history. Canberra led by eight points with around two minutes remaining. A try was almost scored by Nick Cotric after a kick to the corner. The Penrith Panthers then proceeded to score two four pointers, with Matt Moylan calling the shots. It was gut wrenching, heart breaking. We saw it, but it was hard to believe it happened, inconceivable. Raiders win in golden point over the Dragons: Canberra lost three times in golden point in 2017 - once to the Cowboys and twice to the Sea Eagles. But in Round 19, the Raiders finally had their own golden point win! 18-14 over the Dragons. In the 83rd minute, Aidan Sezer produced a brilliant 40/20 kick... it was more like a 30/10. And that set up the match winning play... a terrific offload from Dave Taylor to Elliott Whitehead for the golden try. Round 8: Jordan Rapana: In the 73rd minute of the clash with the Sea Eagles, the scores were locked 14-14. Blake Austin put in a terrific kick to the corner, and Rapana chased. Just when it looked like the ball would go dead, Rapana somehow grasped it and planted it in the corner of the in goal, most of his body in the air, hovering outside the field of play. Only his hands and the ball on the ground were inside it.